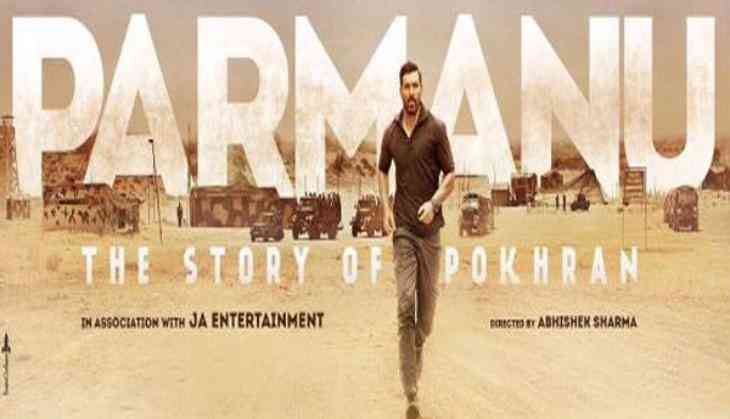 Actor John Abraham on Monday released yet another poster for his upcoming Bollywood flick ' Parmanu: The Story of Pokhran'. The actor, who plays an Army officer in the film, had released the first poster in June. John posted the latest poster on his Twitter handle, captioning, "Embark on an extraordinary journey this December with @ParmanuTheMovie #ParmanuTheStoryOfPokhran @johnabrahament @kriarj"
The poster depicts as if John is running with Army trucks and base camps at his back. The film is based on the nuclear bomb test explosions conducted by India at the Indian Army's Pokhran Test Range in 1998. The movie is directed by Abhishek Sharma and produced by Zee Studio, JA Entertainment and Kriaj Entertainment. 'Parmanu: The Story Of Pokhran', which also features Diana Penty and Boman Irani, is all set to hit the theatres on December 8.